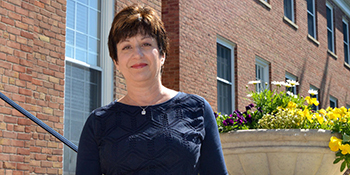 Michele Tesch is the executive administrative assistant for Academic Affairs at Cazenovia College. Her job is a busy one as she is responsible for coordinating events such as the academic awards banquet, dean's list reception, and study abroad trip to Canterbury, as well as updating the college catalog and academic web pages, and much more. Tesch enjoys the challenge of her position and the variety of tasks. Tesch works for Dr. Sharon Dettmer, vice president for academic affairs and dean of the faculty, who also keeps her busy. She enjoys working at the college for many reasons, but one of the main reasons is that she has a "really great boss." Tesch has worked at Cazenovia College for five years. Starting in early January 2013, she began working as an administrative assistant with Project REACH. She loved her position, but when she heard about the job opening in Academic Affairs, knew it was the perfect job for her. Born in Rochester, NY, Tesch began her career after earning an associate degree at Monroe Community College. She held several different positions in a law book publishing company, the last one proofing law books. When her third child was school age, Tesch worked as a teacher's assistant for an elementary school. When her family moved to Virginia, she worked as a secretary at an alternative middle/high school. From Virginia, the family moved to Olean, NY, and Tesch worked as the billing manager for an oil and gas law firm. The last move was to Syracuse and Cazenovia College. Outside of the College, Tesch enjoys reading and crocheting. She also likes working on her side business selling cosmetics. Her husband is a pastor and a TSA officer. Tesch and her husband are committed to helping others and with a group of friends, are making plans to start a Syracuse chapter of "Sleep in Heavenly Peace," an organization that builds bunkbeds for children who usually have to sleep on the floor. Tesch has three married children—one living in Texas, one in Virginia, and one in Rochester. She also has three grandchildren in Rochester whom she loves dearly. Tesch shares that she also has a 13-year-old blind and deaf rescue bichon frise named Max. Tesch has thoroughly enjoyed her time here at Cazenovia College. She praises the College for providing students with a high-quality education through faculty and staff who genuinely care about them. "I love the students and enjoy getting to know them. I hope they feel my office is a welcoming place when they come to ask a question or just to visit and pick up a piece of chocolate," comments Tesch. From Tesch's many tasks to getting to know the students, she is a staff member who enjoys every day she spends on the job.